France? Spain? Where can you find beautiful limestone? Today started bright and early with a trip to the Shepherdstown Sweet Shop (bakery) and The Lost Dog (coffee shop) in Shepherdstown, WV. All good days begin this way. A chocolate covered cake donut and a ham/egg/cheese croissant for breakfast, grab a sandwich for lunch (The Winston=tuna salad on a delicious onion roll), and then a delicous brew by the The Lost Dog. This morning it was a jasmine green tea with honey and cream. Then, it was Harpers Ferry time. 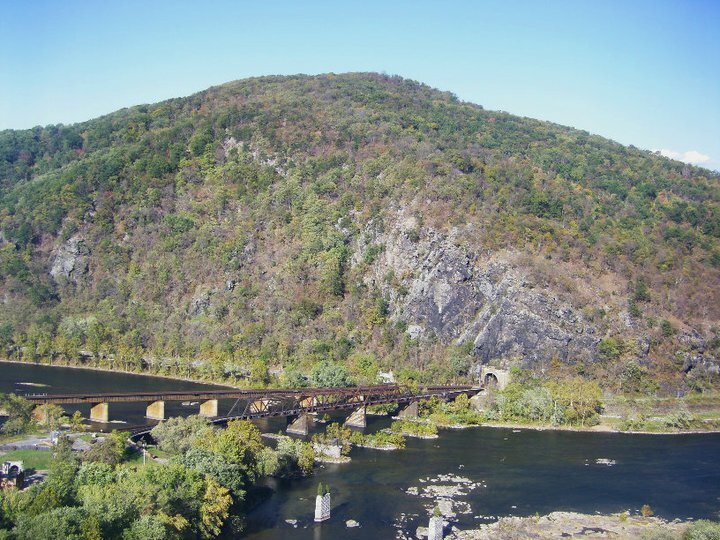 It's cold, WINDY, and beautiful in the Harpers Ferry gorge right now. Below are some photos from Monday (12/27/10) afternoon. Ryan Smith of "Chase and Smith Photography" and "Ryan Smith Photography"
(http://www.csphotographs.com/ & http://www.ryansmithphoto.com/ ) recently flew over Harpers Ferry in a helicopter. Ryan took some photos from the air and has made them available to us. Please check out Ryan's other creative professional photography endeavors at the two websites listed above. John Kelbel of http://patapscorock.blogspot.com/ recently visited Loudon Heights, Virginia/West Virginia. He rope soloed and rapped the cliffs to check them out. Afterwards he wrote a trip report to some friends about his adventure and has given permission to use it here. 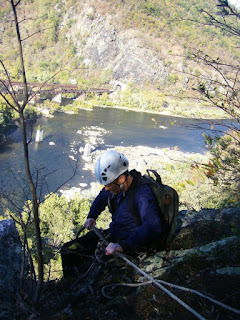 Read on for his account of Loudon Heights and to see some photos of some good looking climbs. The Highlands of Elk Ridge have some really nice boulders. 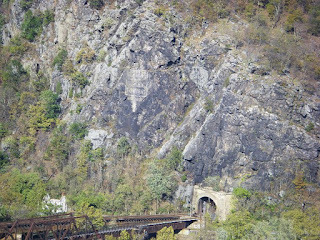 This area has a great feel to it as these boulders sit far up above the noise of the river, the roads, and the train tracks that run through the gorge. The Highlands area is above Balcony Jr. HERE(map) HERE(rope) which has been featured in previous posts. See the Bouldering guide for info on the area. You can see Left's Last Stand coming out the flat shaded roof. Steve on one of a couple cool overhanging problems in the Upper Highlands. In the guide these are problems #77-81. These photos were taken from below problems 75 and 76 (Iron Pickle Project). 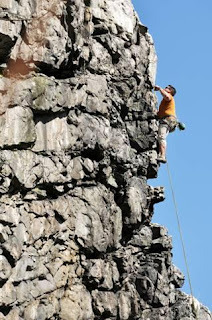 Steve climbing The Struth. HERE This boulder is 50 feet left of Balcony Jr. This boulder has an engraving on it from the 1800's. If you click on the photo to see a larger version you can just see the engraving (rt of climbers head). This overhanging face has the top Super Project boulder problem in Harpers Ferry, HERE. The Super Project is problem #61 in the guide. From what I can tell this problem is probably V10 or harder. The holds are a downsloping finger rail, a shallow two finger "Pocket", a distant crimper and some other holds. What really makes it hard is that the feet are pretty bad. Bring your guns!. 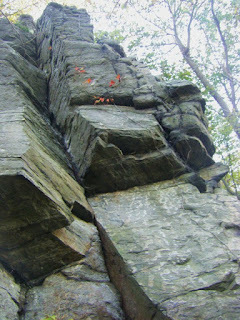 When you are up there try the orange colored arete to the left of the overhanging face, Dan's Arete. This problem was put up on a very cold winters day by a guy named Dan. This highball with some "easy" projects. We use to call the most prominent one the Iron Pickle Project. It has been tried but never climbed. The photo looks directly at the Lone Ranger with Cheken Head Chuck just visible on the left end of the boulder. Problems #74,75 ascend the prow on the right end. The Iron Pickle Project is just out of view on the right side. This photo was taken from the boulder with problems #71,72. Below are some other shots of the boulders in the woods and one boulder that looks very much like a rabbit. Taken from on top of the Iron Pickle Project (#76) looking downhill. On the left side of the photo you can see problems #77-81. 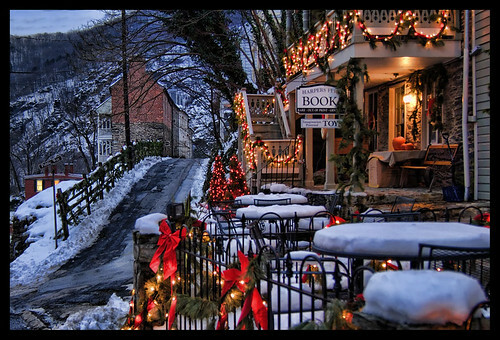 Thanks to Steve E. for the great photos of the Highlands Area. We made a return visit to Balcony Jr on Halloween. We'd already encountered a couple climbers at Balcony on our approach & upon arriving at our destination, we met Harpers Ferry local Steve bouldering on the Sunshine Wall (HERE, problems #13-19). After rigging a top rope on the arete at the Eastern end of the crag, I was able to snap a few pics of Steve doing Big Dipper on the Starlight Boulder . You can see this problem climbed in the Harpers Ferry Bouldering Video . ... of climbing activity that is. 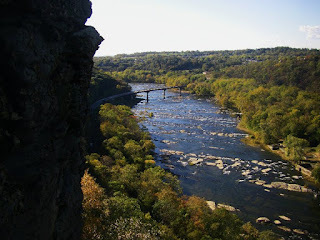 Indy and his band of Maryland climbing afficianados have been climbing at Balcony Jr. They have been exploring new lines and have come up with some good ones with climbing difficulty anywhere from 5.6 to 5.11. He reports that Balcony Rock continues to see climbers. They visit it for the great low to mid range difficulty climbs that it offers. There is also word of bouldering activity on Elk Ridge. 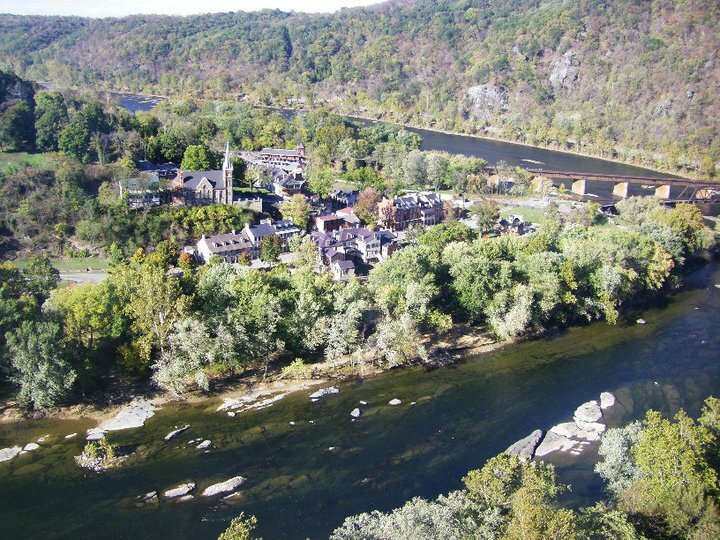 I'm hoping this aspect of Harpers Ferry Climbing will pick up. There are so many good boulder problems on all kinds of terrain that everyone can go home happy. Remember, the climbing on Elk Ridge is the perfect Maryland winter climbing location. The sun hits this south facing hill all day long. The conditions on a calm, sunny, 40 degree day are absolutely unbeatable. Below are some photos compliments of Indy and his crew. See previous posts for more photos on Balcony Jr.
Lori trying not to flame out on "The Founder's Forge"
Carl working up "Mojo Filter"
Carl getting down with "Grooving Up Slowly"
Carl fighting his way up "Serious Callers Only"
If you want to share photos from your Harpers Ferry Climbing adventures just send an email to Conrad at harpers ferry climbing . com with your best shots or post a comment on this blog with your story.